What It's Like: One of the most spectacular northern wilderness trips in the world. 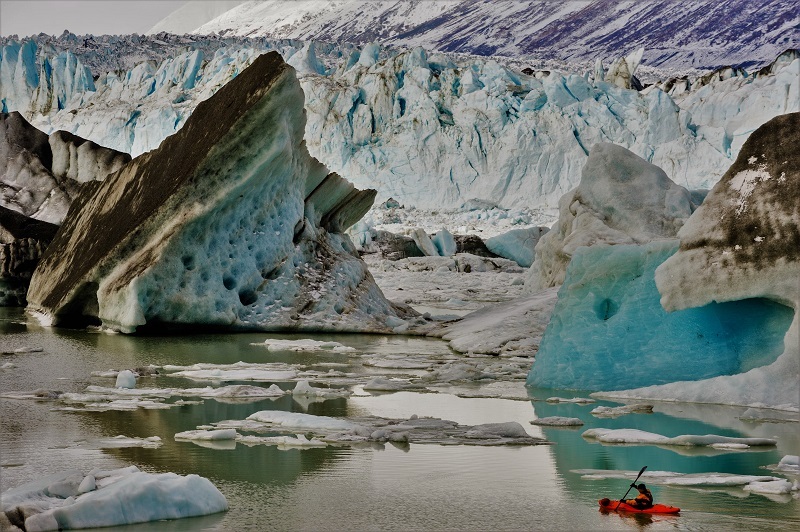 Challenging logistics, epic glaciers. Scouting/Portaging: Easy, except if you can't run Turnback Canyon then you face one of the most grueling portages out there. 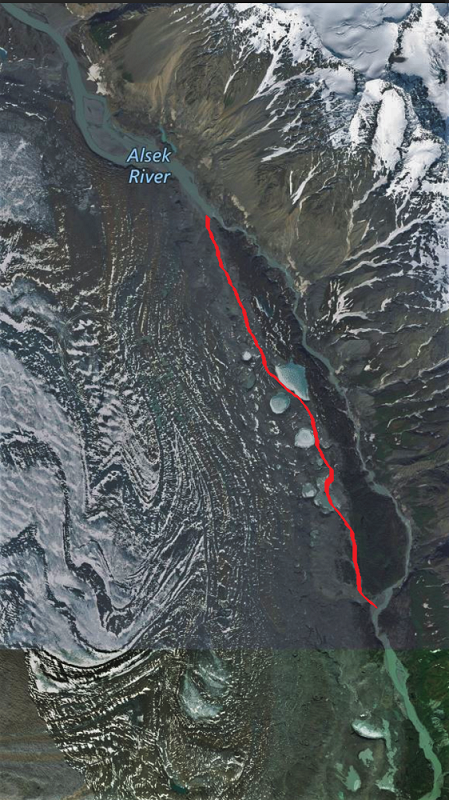 It's a 6 km, day long hike over the terminal moraine of the Tweedsmuir Glacier. Level: For Turnback Canyon 300 - 700cms. 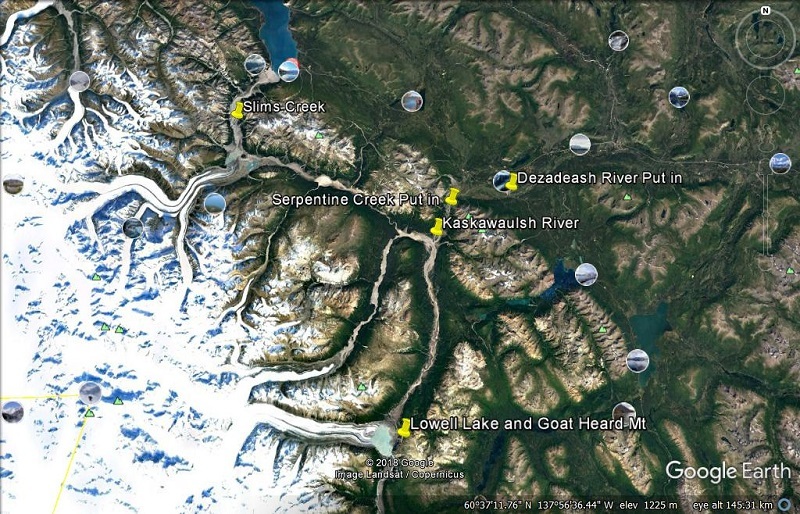 Use Alsek gauge above Bates River. If committed to portage the canyon, 300-1500+ cms, flow is not critical. 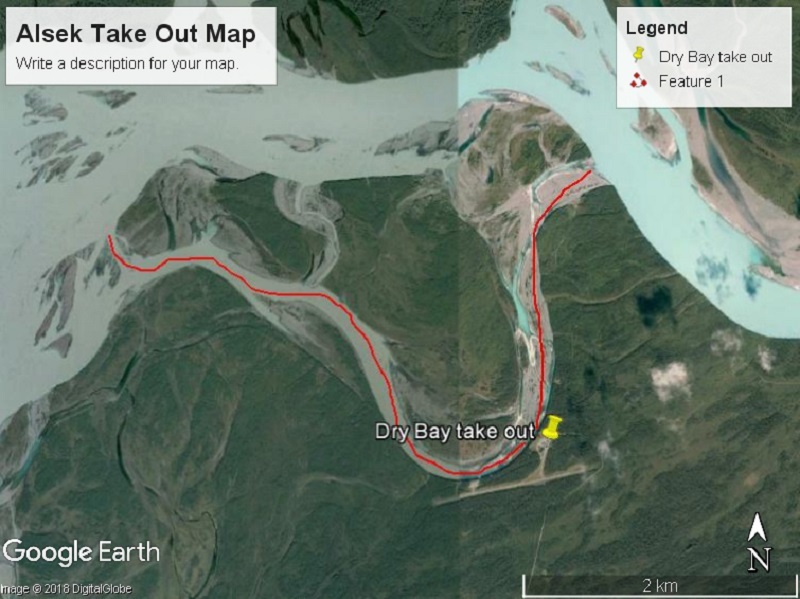 Also see Alsek River at Dry Bay (take out). Time: 8-10 days (depends on how much hiking and exploring you want to do). When To Go: September or October if you want to attempt the canyon. You need cold and dry weather. If you commit to portaging Turnback, go in July-September. 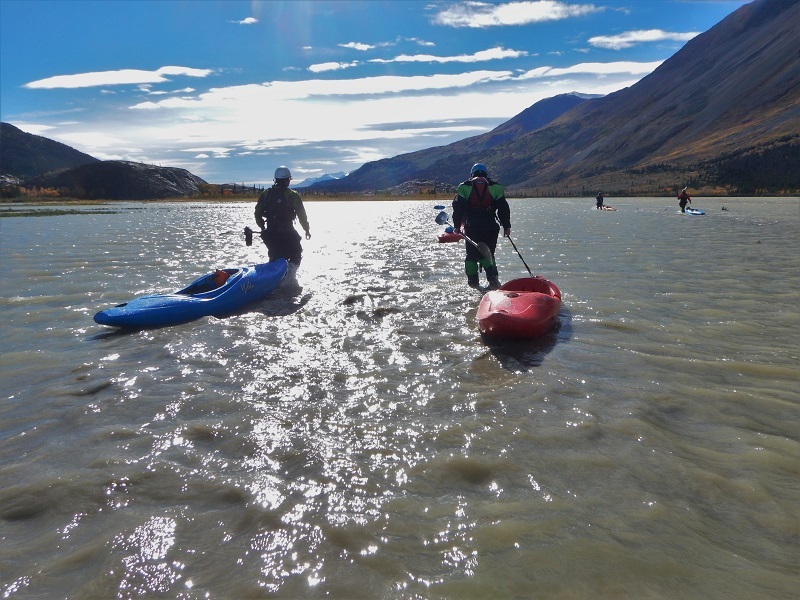 Keep in mind this information is directed at kayakers using the Desadeash put in to paddle or portage Turnback Canyon, not the Tatshenshini-Alsek route that starts on the Tatshenshini. 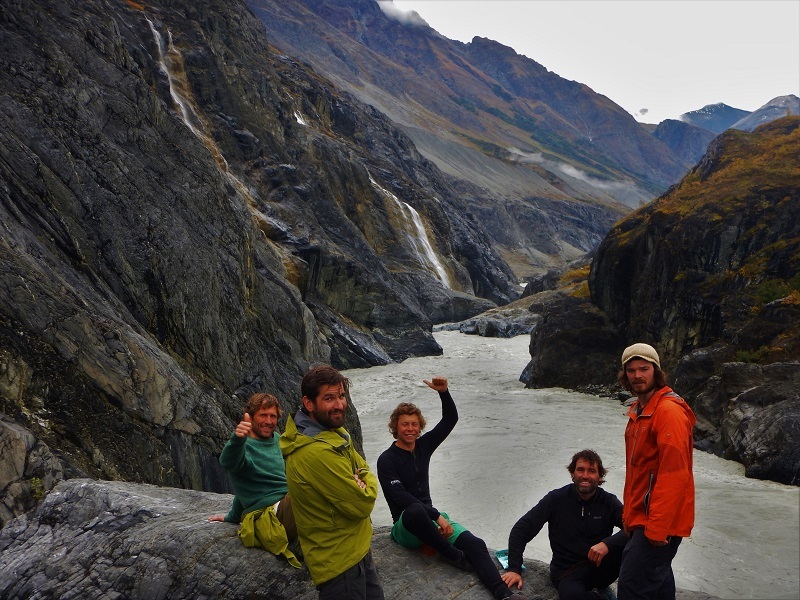 The Tatshenshini-Alsek confluence is well below Turnback Canyon, and lets rafting trips avoid an unmanageable or costly (helicopter) portage around the canyon. 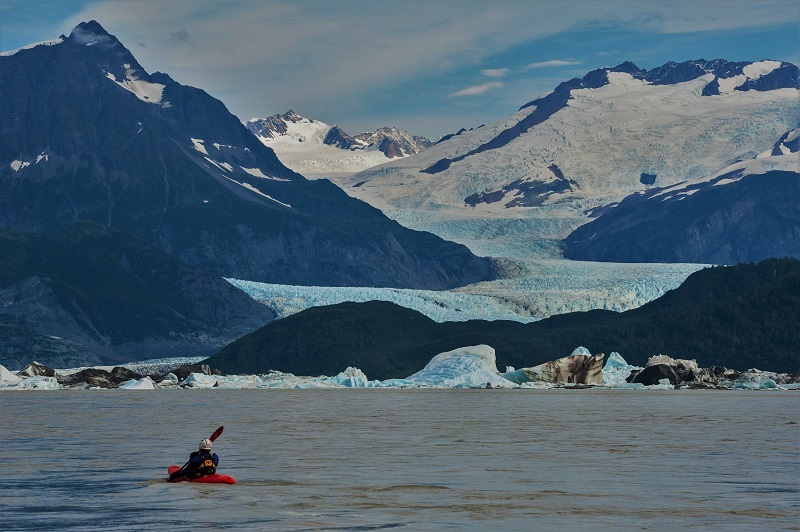 The Alsek is one of the most spectacular wilderness runs in North America. The 265 km journey through the St. Elias Mountains, the highest coastal mountain range in the world, will take a group eight to ten days. The river travels through a Canadian Territory, a Canadian Province, and a US State. 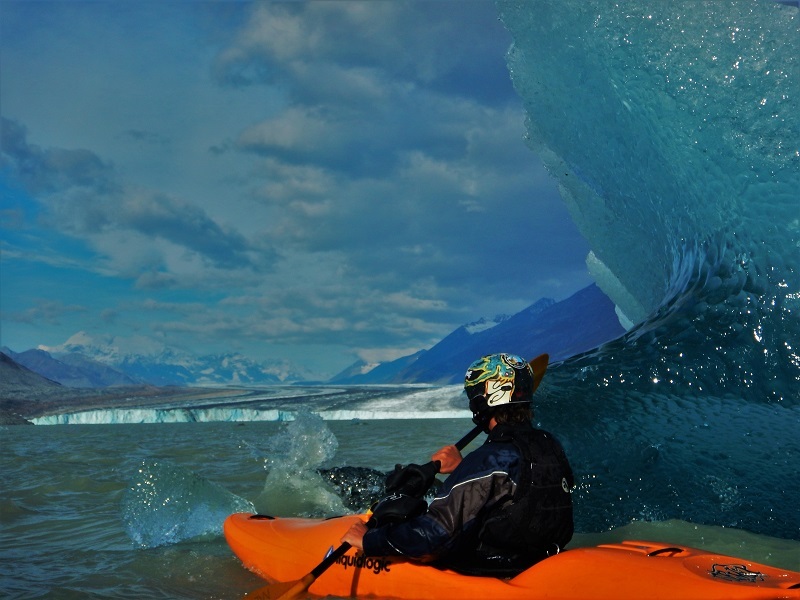 A testament to the majesty of the region is that one has to travel through three major parks - Kluane National Park in the Yukon Territories, Alsek-Tatshenshini Provincial Park in British Columbia, and Glacier Bay National Park in Alaska - in order to complete the trip. These parks have been designated together as a UNESCO world heritage site, being the largest protected area in the world covering 97,000 square km and containing the greatest ice caps in the world outside the poles. 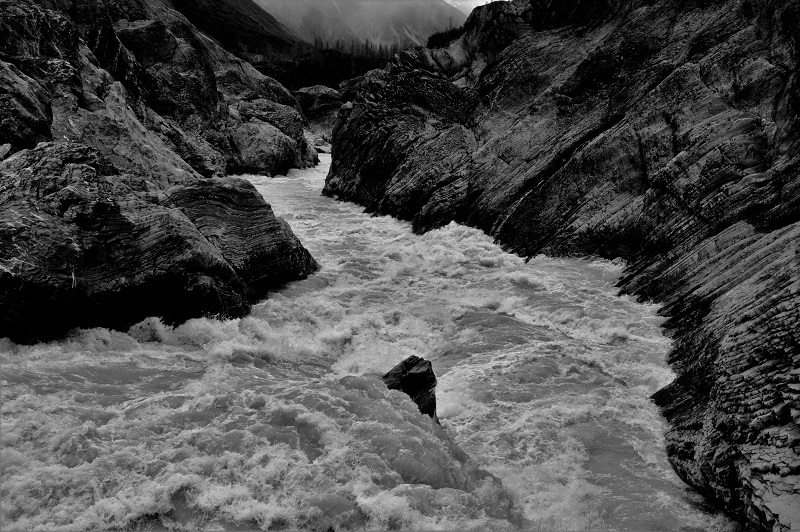 The crux of the journey is Turnback Canyon, a harrowing section of class V+ whitewater. In 1971, Walt Blackadar at the age of 49 took on the first descent of the canyon by himself in August at high flows. The experience left him feeling lucky to be alive and he went on to describe the run as unpaddleable. Since the legendary first descent of Turnback Canyon several groups have managed to successfully paddle this section, but the ideal conditions for running the canyon are elusive. 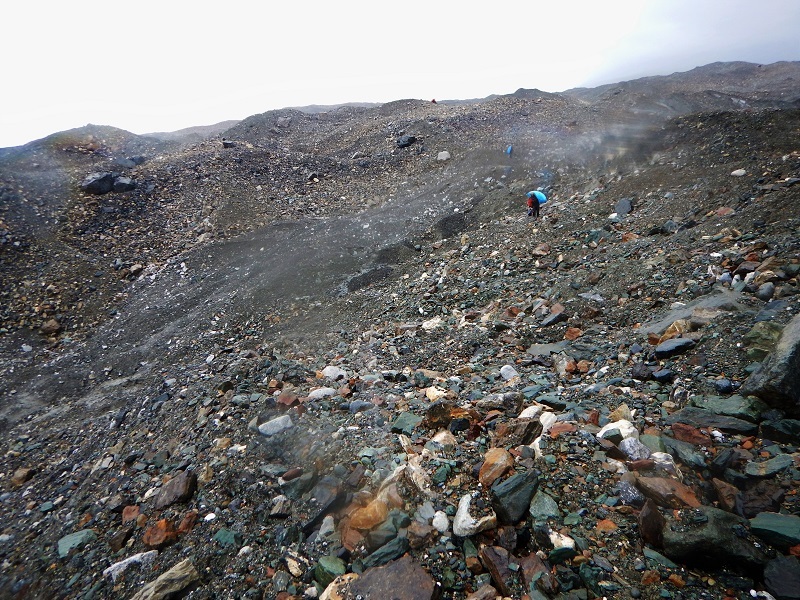 In 2016, glacial retreat in the headwaters of the Alsek resulted in the diversion of a large amount of flow into the drainage. 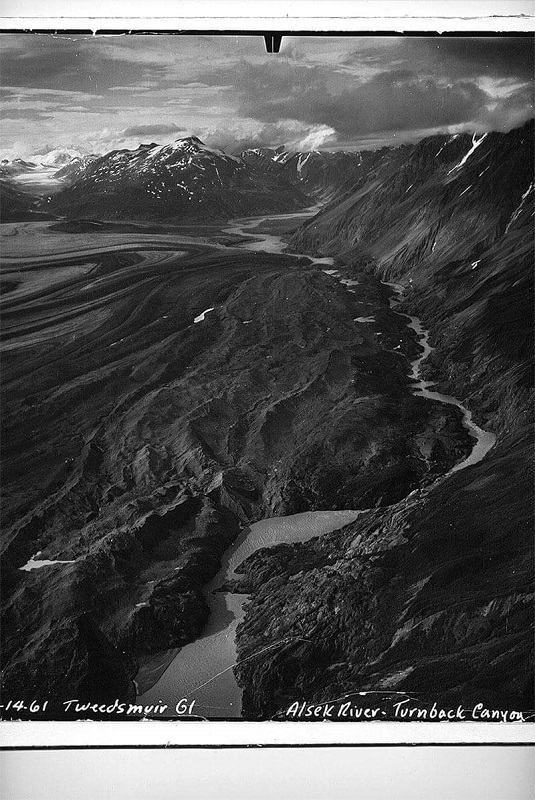 The Kaskawulsh glacier previously fed both the Yukon and Alsek River watersheds via Slims Creek and the Kaskawulsh River, respectively. Since 2016 the glacier has retreated enough to no longer drain into Slims Creek, and now all of the meltwater has been diverted into the Alsek drainage. At the time of writing, the low-flow window for running the canyon is much shorter and in colder temperatures than in years preceding the flow change event. In this harsh and unforgiving landscape you are hundreds of kilometers away from help. Not only are you likely to experience a high variety of savage weather conditions including maddening winds and rain, but the water is as close to freezing as imaginable. Previous multiday experience is an absolute must for anyone going on the trip, and every group member should be equipped for cold weather conditions. 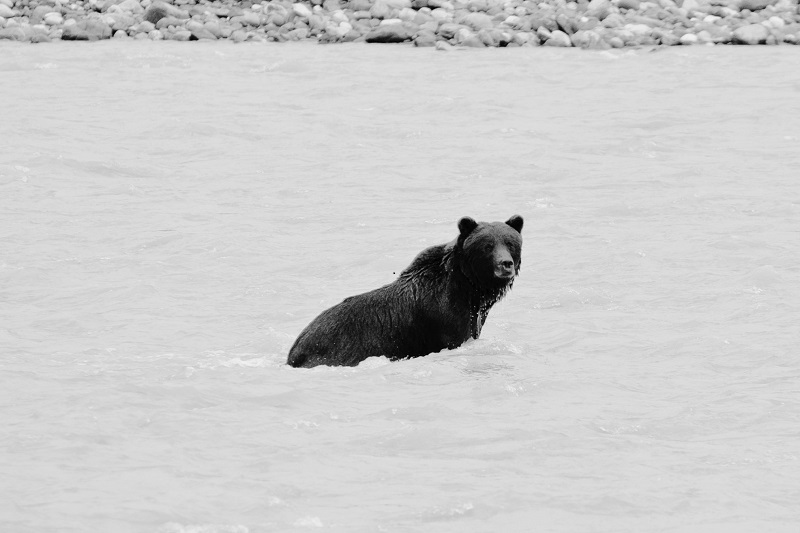 With some of the highest grizzly bear densities in the world, many beaches along the river look like bear highways, some of which you are not allowed to camp on. Be prepared for bear encounters. Those going on the trip but not running the canyon should still be competent class IV paddlers. 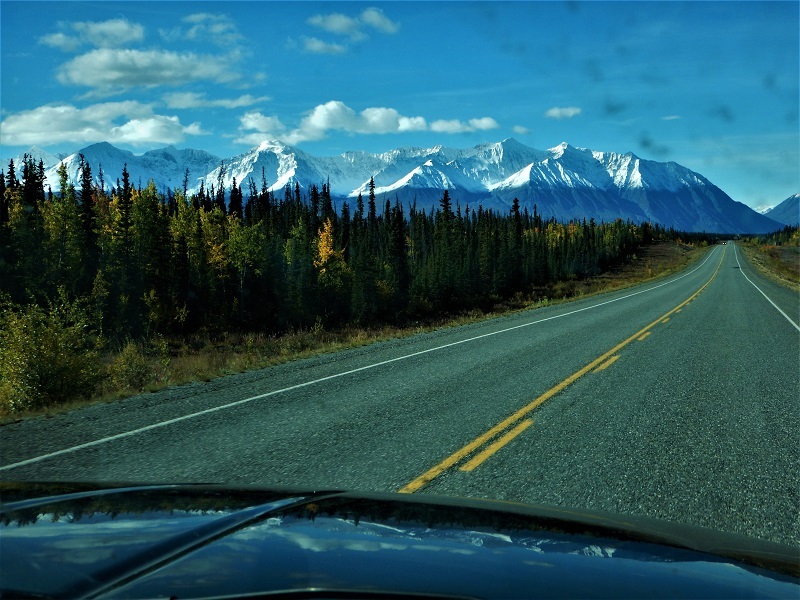 Just south of Haines Junction, the Alaska Highway crosses over the Dezadeash River, the logistically simpler put-in. The Dezadeash has an infinitesimally small gradient and a high potential for strong headwinds. Many rafting trips have put on 19 km downstream at the mouth of Serpentine Creek. In order to access this put-in, drive 10.6km north on the Alaska Highway and turn right on Nygren Subdivision Rd. Continue down this gravel road for 13km directly to the put-in. Dall's Sheep have been observed along the slopes in this section. The Dezadeash River quickly drains into the Kaskuwalsh River after the Serpentine Creek put-in to become the Alsek. This reach is mush wider, but still has no current and high winds. The remaining 38 km has several class II-III wavetrains, and Lowell Lake marks the end of this section. Next to this stunning iceberg speckeled lake is Goatherd Mountain, atop which is a great vantage point of the 65 km long Lowell Glacier and Mt Kennedy (4250 m). Hiking up is highly recommended to appreciate the view, and keep an eye out for mountain goats along the way. The biggest rapids of the trip besides Turnback Canyon are on this section. 'Sam's Drop' (75 km) and 'Lava North' (79 km) are the two rapids of note (Class IV) that are both easy to scout. Grizzly encounters are common at these places, so scouting in groups, making noise, and keeping vigilant watch will help deter any run-ins. Turnback Canyon has a wild and rugged feel to it. On one side is 2079 m Mount Blackadar, on the other side is the 11 km long terminal end of the Tweedsmuir Galcier, and within it lies some of the most committing big-water class V+ on the planet. 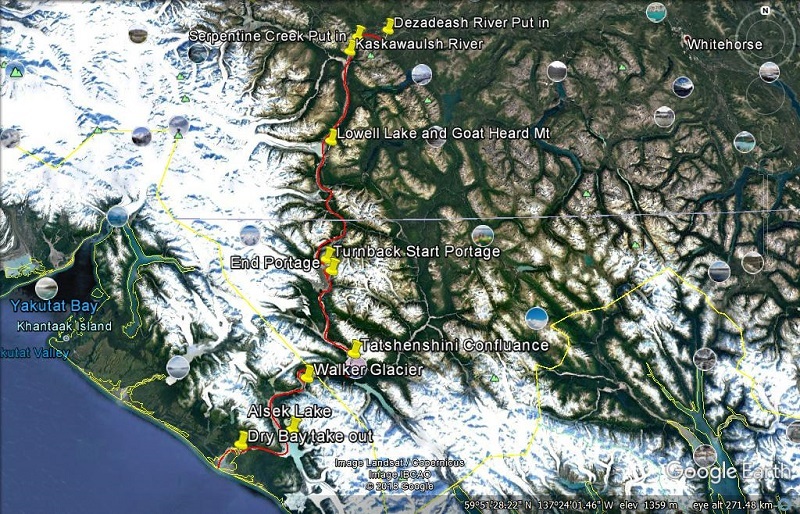 In the past, several groups have taken 2 days to complete a portage of the canyon, but careful route selection can reduce travel time down to 5-6 hrs. The best place to begin the portage is right before the canyon walls appear on river right. There is a small beach from which the team can prepare for the hike. It is important to keep your group together whilst moving through the moraine in which hidden ice caves and small rock slides are not uncommon. Keep the alder brush to your left in sight as you hike up and down large deposits of terminal moraine, but do not enter into the brush. Once you come to and traverse the chain of small lakes that mark the halfway point of the portage, follow the outlet creek back down to river where you will find the last rapid of Turnback Canyon just downstream. A map of this route can be found below. Portaging the last rapid requires a committing ferry to the river left bank above the drop. The higher the water the more hairy the ferry, which may be challenging for weaker paddlers. There are a couple of class III+ rapids a few kms downstream of the canyon. 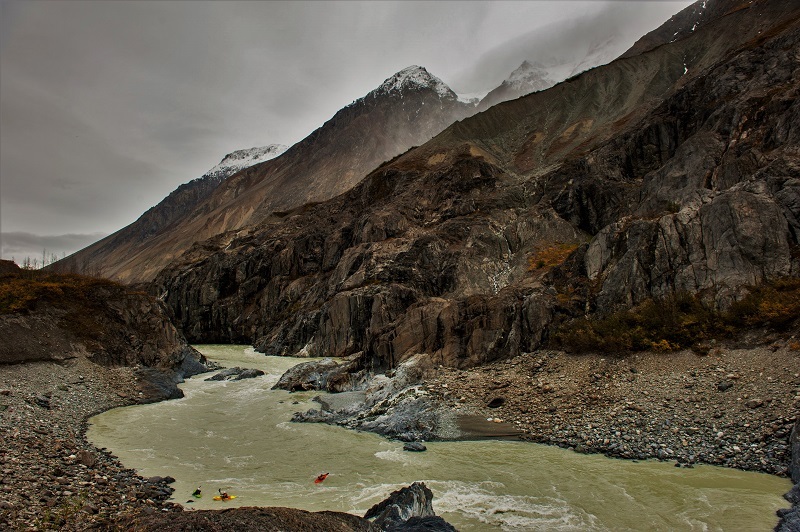 The river valley then widens and provides a gentle float down to the Tatshenshini confluence. 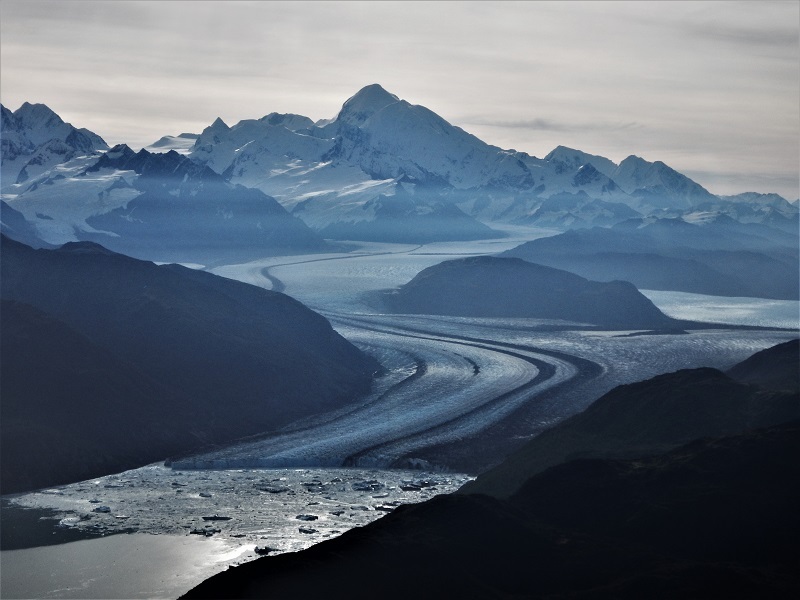 The nature of the landscape changes drastically in this section to a coastal type of mountain range, and the number of visible glaciers is astonishing. 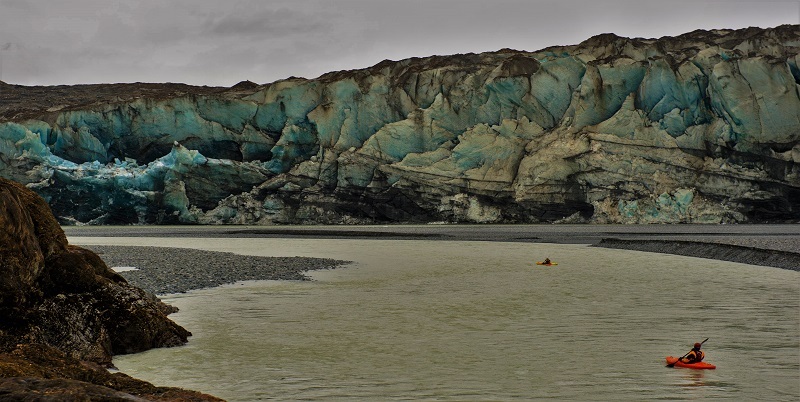 The spectacular Walker Glacier at the 208 km point is a great place to camp and explore. 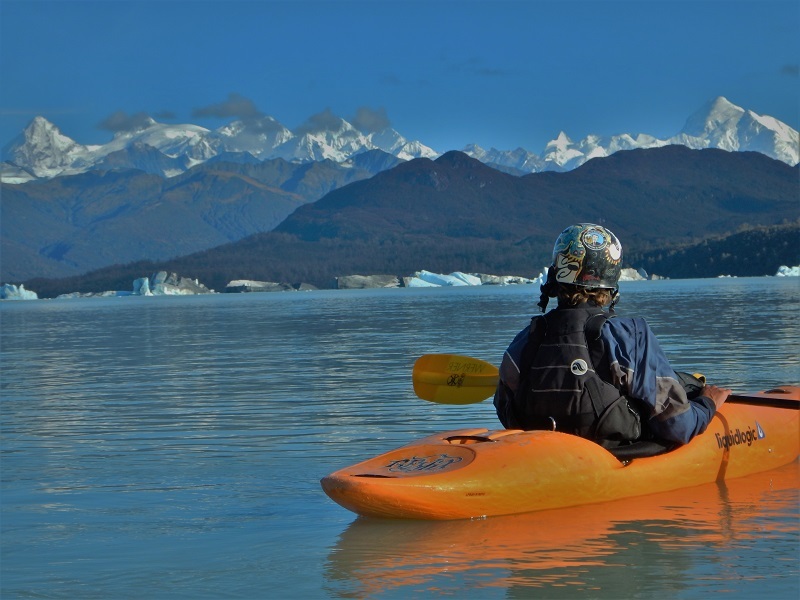 A day of flatwater later is the entrance to Alsek Lake, the largest glacial lake on the trip. The Grand Plateau and Alsek Glaciers release very large icebergs in to the lake, from house sized to Millenium Falcon sized. If weather conditions permit one can see Mt Fairweather to the east, which is BC's highest peak standing at 4671 m. Beware of rolling icebergs while exploring the lake and glacier calving activity while checking out the edge of glaciers. When large portions of ice are released, powerful waves are generated which travel long distances. Any gear left close the the lake's edge can be washed away by these waves, so stow equipment on high ground. 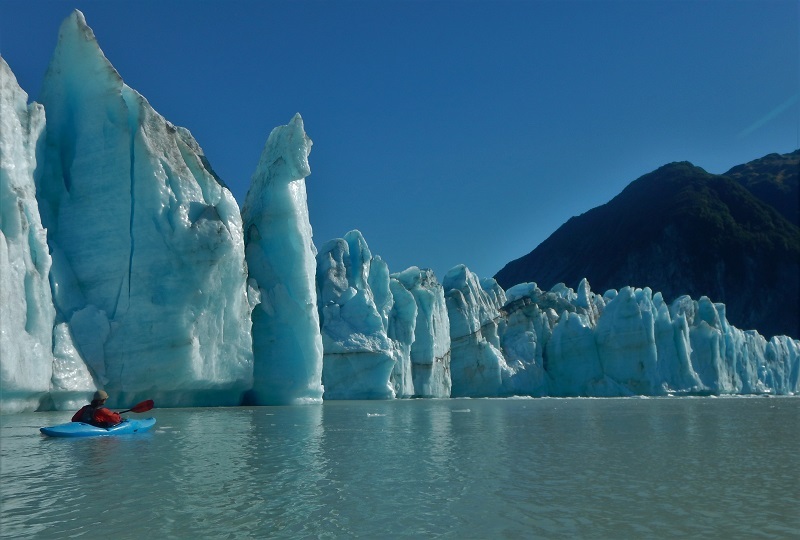 Keep in mind that there may be large icebergs either blocking or flowing down the outlet of Alsek Lake. There are a couple of easy to avoid class III rapids, one of which is a huge playwave for any aerial acrobats on the trip. Seventeen kilometers from the outlet of the lake there is a dried up side channel on river left which is sometimes marked. This is the take-out for the trip. From here it is a 2 km hike along the dried up channel to the ranger station/airstrip. An alternative take-out option is available at higher flows. Continue another 4 km downstream to where the side channel flows back into the main channel, and paddle up it for approximately 4 km right to the ranger station/airstrip. Using the secondary take-out access avoids having to hike your boat and gear, but is difficult to navigate will be dry at lower flows. The ranger station is closed after September and there is a small shelter adjacent to the airstrip. Bringing a day or two's worth of extra food would be prudent because of potential weather delays for the pickup flight, which are common in this area. Get to the city of Whitehorse, Yukon. The entire group must drive to Haines, Alaska and register with US customs. Leave a vehicle at the air strip. Drive to Haines Junction to put in. Fly from Dry Bay back to Haines. The permit process is complicated and expensive. Click on the following link for detailed instructions. 1. Apply for a takeout date through Yakutat Ranger Station (lottery system). 2. Purchase you BC Parks permit. 3. Apply for you put on date and buy your Kluane National Park Permit. 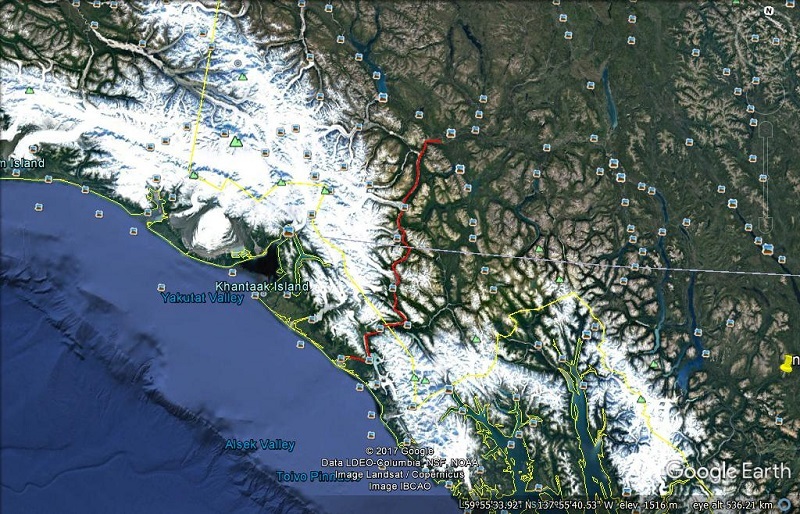 The path of the Alsek through the northern coast mountains. 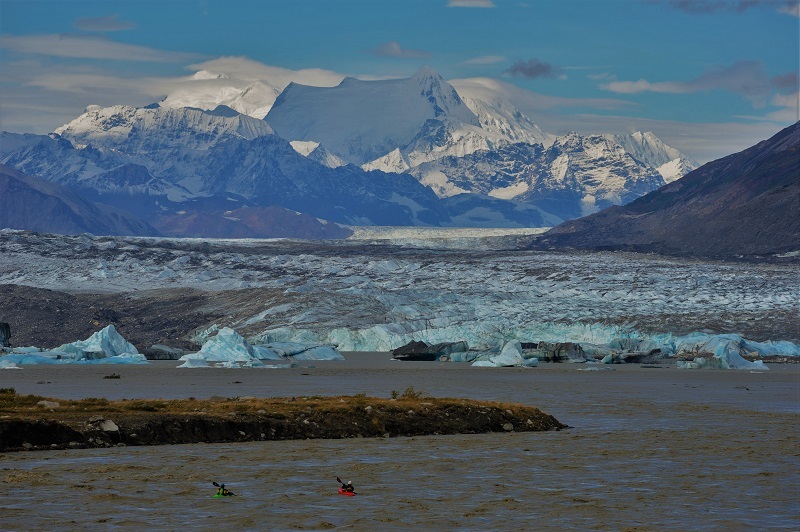 The Alsek kayak route. The Tatshenshini entry is not shown here, and enters well below Turnback Canyon. A map of the upper Alsek. Route for the Turnback Canyon portage. Dry Bay take out area. Dragging boats against a strong headwind on day 1. Another world - Lowell Lake. Glacial ice of the Lowell Glacier. This large grizzly charged the group on one trip. The Tweesdmuir Glacier on the approach to Turnback Canyon. The entrance to the Turnback Canyon S-turns at high flow. Hair Rapid in the heart of Turnback Canyon. The last part of Turnback Canyon. A historic photo of Turnback Canyon. A glacier feeding Alsek Lake. Mt. Fairweather on the flight back to Haines.